Envirofluid was able to provide the Australian Defence Force with a worksafe, organic, descaler which was guaranteed not to create waste water treatment issues or erode metal surfaces. The low risk acid blend of Triple7 Enviroscale especially designed with human safety in mind meant that minimal safety equipment was required and reduced risk to Defence members. The product also prevents odours and retards the production of H2S (hydrogen sulphide) fumes. Using Triple7 EnviroScale to flush the sewer systems reduced the requirement for breathing apparatus and safety equipment. Furthermore, it eliminated the risk of corrosion or damage to elastomeric surfaces. The Australian Defence Force needed to eliminate the organic and scale build up in sewage systems on-board their submarines. 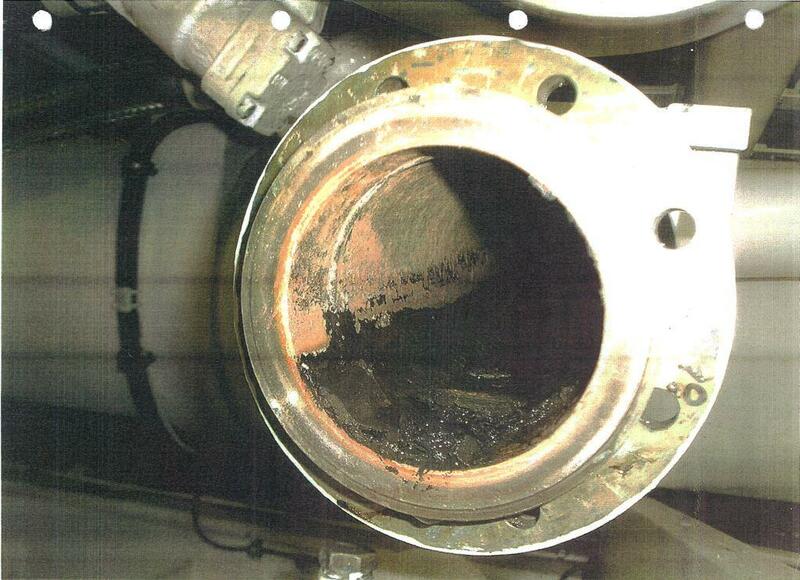 The hydrochloric acid based limescale remover they were using was causing corrosion in the pipework and toxic waste disposal issues. Cleaning with the Class 8 DG rated product was a high risk WHS hazard, especially in confined spaces, with full PPE required. How do you effectively clean sewage systems without dismantling them whilst ensuring there is no pipework damage of generation of hazardous gases (especially Hydrogen Sulphide H2S which can result in death)? Hydrochloric Acid has traditionally been used for pipework flushes to remove limescale build-up. Hydrochloric Acid is registered as a Class 8 Dangerous Good with highly corrosive properties. Corrosive to the eyes, skin, and mucous membranes. Inhalation: Irritating to respiratory system. Inhalation of vapors can cause coughing, choking, chest pain, inflammation and ulceration of the nose, throat, and upper respiratory tract, and in severe cases, pulmonary edema, circulatory failure, and death. Ingestion: Swallowing hydrochloric acid can cause immediate pain and severe burns of the mouth, throat, esophagus, gastrointestinal tract and stomach including ulceration, perforation and scarring. Oral exposure may cause corrosion of the mucous membranes, esophagus, and stomach, with nausea, vomiting, and/or diarrhea. Severe abdominal pain and bleeding, breathing difficulties, shock, convulsions and collapse may also be experienced. Swallowing may be fatal. Skin Contact: Can cause redness, pain, and severe skin burns. Concentrated solutions cause deep ulcers and discolor skin. Repeated or prolonged contact may also lead to dermatitis. Eye Contact: Vapors are irritating and may cause damage to the eyes. Contact will cause severe irritation to the eyes, which can result in redness, stinging, pain, loss of colour vision (blue vision), corneal oedema, lachrymation and possibly irreversible eye damage including corneal burns. Chronic Exposure: Long-term exposure to concentrated vapors may cause discoloration and erosion of teeth. Chronic occupational exposure to hydrochloric acid has been reported to cause gastritis, chronic bronchitis, dermatitis, and photosensitization in workers. Chronic inhalation exposure may cause hyperplasia of the nasal mucosa, larynx, and trachea and lesions in the nasal cavity. Triple7 EnviroScale was substituted in place of the current cleaning agent. The powerful botanical formulation removes scale and organic build-up from virtually any surface, without corroding the surface material. With a non-hazardous product that met strict defence guidelines (NSN 6850-66-152-0080 [20Litre] and NSN 6850-66-152-0081 [200Litre]) the Australian Defence Force eliminated high WHS risks, lowered disposal costs and eliminated corrosion issues.